Washington, NJ: Process equipment manufacturer The Witte Co., Washington, New Jersey (www.witte.com), has unveiled the food grade Witte 418-D, a multi-step system that integrates sanitary drying, cooling, classifying and fines collection in a single, compact unit. 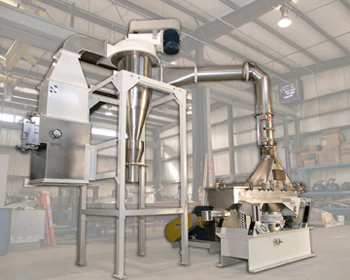 Applying the breakthrough engineering of the Witte 400 series plastic pelletizing system in a sanitary design, the Witte 418-D features a vibrating fluid bed dryer, a wire mesh fines collection screen, steam-heated air supply and cyclone exhaust with blower with continuously welded and polished T-304 stainless steel in product contact areas. Ideal for processing starches, nuts, snack chips and other food and dairy products in low volumes or in pilot scale lab settings, the Witte 418-D meets USDA, FDA and 3-A Standards and Regulations for contact with food and dairy products. The system also includes an exhaust air silencer to support compliance with OSHA specifications for permissible sound exposure levels and high-efficiency particulate air (HEPA) filters on both the air supply inlet and the exhaust to promote hygienic drying while also permitting the safe return of the filtered process air into the plant or outdoor environment. Designed for easy inspection and superior cleanability, the Witte 418-D is fitted with the company’s signature Witte clamp in stainless steel that releases with one hand and allows quick access to the drying, cooling and classifying sections within seconds. The Witte 418-D is available with a choice of steam, gas, or electric process air heating systems to suit the requirements of the installation and may be customized for scale-up to high volume processing.